Gov. J.B. Pritzker is pushing to eliminate Illinois’ flat tax protection in order to pass a progressive income tax hike, which Pritzker has dubbed a “fair” tax. But how much more will average Illinoisans pay under Pritzker’s plan? In his Feb. 20 budget address, Pritzker pointed to Iowa and Wisconsin’s progressive income tax rates as models for what Illinois’ rates should look like. 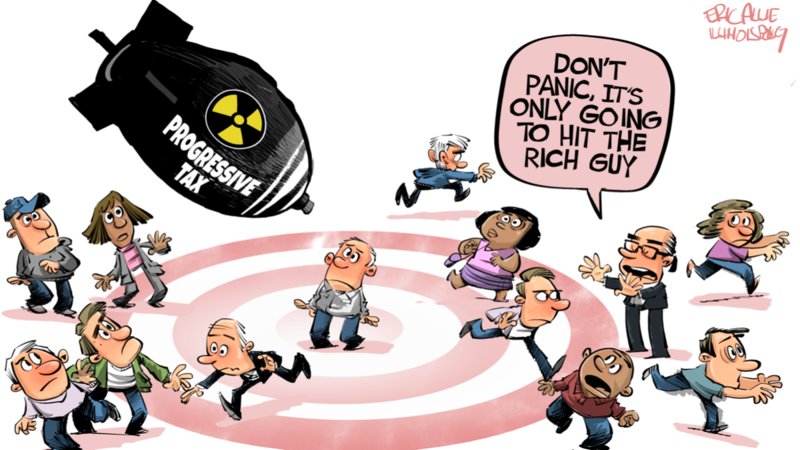 But while Pritzker has said a progressive income tax would only hike taxes on the “rich,” Illinoisans making as little as $26,100 (under Wisconsin rates) or $46,500 (under Iowa rates) would see an income tax hike should Illinois lawmakers take the governor’s lead. The typical Illinois family with two children would shoulder an especially heavy income tax hike under Wisconsin and Iowa rates. The median Illinois family making $79,168 would see a $516 income tax hike if Illinois adopted Wisconsin’s rates and a $610 tax hike if Illinois adopted Iowa’s rates – 15 percent and 17 percent increases, respectively. Keep in mind that in 2017, Illinoisans shouldered the largest permanent income tax hike in state history. And the most recent progressive income tax rates filed in the Illinois General Assembly would have hiked taxes on Illinoisans making as little as $17,300. Pritzker specifically said in his budget address that Illinois “can accomplish” a progressive income tax with “a more competitive rate structure than Wisconsin and Iowa.” But what he means by competition is entirely unclear. In fact, a recent Tax Foundation study on Wisconsin’s tax code recommended exchanging its progressive income tax for a flat income tax as one way to make the state more competitive. Both North Carolina and Kentucky have swapped their states’ progressive income tax for a flat income tax in recent years. Whether or not state politicians think it’s “fair,” Illinois families simply cannot afford another tax hike.